White truffle oil is rich and fragrant; a little goes a long way. Be sure to seek out white truffle oil made with actual white truffles. Many pseudo-versions use perfumes instead of the real deal. The earthiness of the truffles and the sweetness of the leeks offsets the bitter endive in this side dish that goes with pretty much anything. Preheat the oven to 425 degrees F. Put the endive cut-side-up on a baking sheet. Brush with 2 tablespoons (30mL) of the olive oil. Sprinkle with salt and pepper. Bake for about 25 minutes, until tender and starting to char on the edges. Meanwhile, heat the remaining olive oil in a skillet over medium heat. Add the leeks and cook until golden and starting to caramelize, about 25 minutes. Remove from heat. Stir in the truffle oil, starting with 1/4 teaspoon, adding more to taste. Season with salt and pepper. 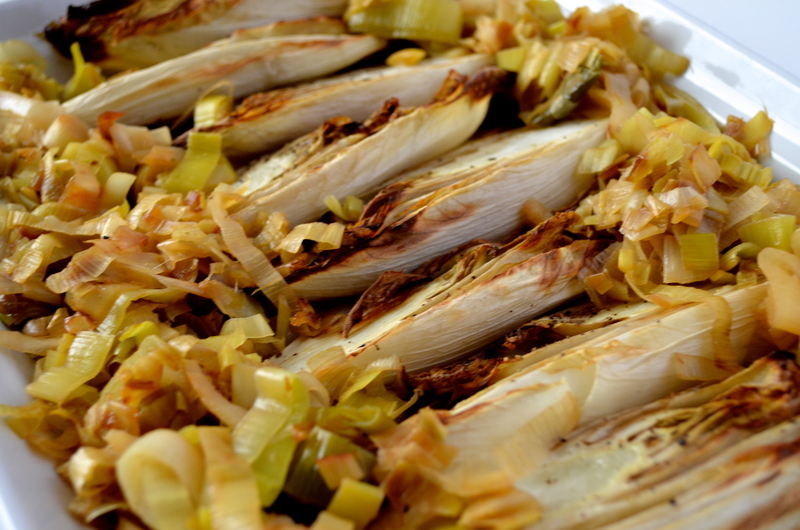 Top the endive with the leek mixture. Serve warm or at room temperature. Looks delicious, Laurie! Thank you for the recipe. Endives rarely make it into my grocery cart, but now I have a very good reason reason to toss them in.